The transition from a planned to a market economy that has been undertaken by the post-communist countries in the EBRD region represents a unique political, social and economic transformation that has taken place in a relatively short period of time. In the last 25 years, the people of those countries have lived through a complete overhaul of their public and social institutions, the emergence of a new private sector, and their reintegration into the global economy. All of those countries suffered an economic recession in the early years of the transition process. In some countries the recession was short-lived, but in others it was deep and lasted many years. While transition trajectories have varied significantly from country to country (particularly when comparing countries in central and eastern Europe with former Soviet republics), academic research has identified one important common characteristic shared by all of those countries: a “transition happiness gap”. Residents of all post-communist countries have, in the past, reported significantly lower levels of life satisfaction than their counterparts in countries with similar income levels that have not undergone transition from a planned to a market economy. Indeed, satisfaction levels in those countries initially fell as incomes declined in the early years of the transition process, but they then picked up again as economic growth strengthened.3 Until very recently, however, satisfaction levels in those countries have not been on a par with those seen in comparator countries with similar per capita incomes,4 defying academics’ predictions that the transition happiness gap would eventually disappear as the quality of public services improved and newly educated cohorts entered the labour market. Why did residents of post-communist countries report lower levels of life satisfaction? Leo Tolstoy’s Anna Karenina opens with the conjecture that “every unhappy family is unhappy in its own way”. However, economists have been able to identify a number of common factors contributing to the transition happiness gap in post-communist countries. In eastern Europe, people’s satisfaction levels may be explained, in part, by their dissatisfaction with their governments.5 The transition happiness gap has also been linked to the traumatic macroeconomic instability experienced at the start of the transition process, the deterioration in public goods and the increase in income inequality during transition.6 The depreciation of human capital accumulated under central planning has also had a considerable impact, with skills acquired prior to the transition process declining in value in the market economy. This chapter re-examines the impact that the transition process has had on levels of life satisfaction and on other measures of well-being using newly available data from the third round of the Life in Transition Survey (LiTS III). LiTS III was conducted by the EBRD and the World Bank in late 2015 and the first half of 2016 and spans more than 51,000 households in 29 post-communist countries (but not Turkmenistan) and five comparator countries (Cyprus, Germany, Greece, Italy and Turkey). The survey includes questions on economic well-being, life satisfaction, beliefs and attitudes, as well as questions on anthropometric variables such as respondents’ weight and height (which allow an assessment of the quality of life in the early years of the transition process). As literature on development economics shows, socio-economic deprivation in the first two years of a child’s life can result in a reduced height as an adult (when other genetic and non-genetic determinants of height are controlled for).7 Thus, comparing cohorts born at the beginning of the transition process with older and younger peers allows claims that transition has been accompanied by major hardship to be subjected to rigorous evaluation. This is an important issue, as the traumatic experiences of the early years of the transition process – whether caused by reforms or the bankruptcy of the previous regime – are often cited as the key factor explaining subsequent declines in the popularity of the market economy and democracy and the resulting policy reversals. Given that the transition process (as defined in Box 2.1) took place in the early 1990s, LiTS III represents the first opportunity to carry out this exercise. Just a few years ago, the cohorts who were born during the transition process were still growing up. Only now can their adult height and life satisfaction be compared with those of their counterparts in other countries. Second, analysis of the height of cohorts born around the time of transition shows that the early years of that process were indeed accompanied by major socio-economic deprivation, with those people ending up shorter than their peers. It also shows that the impact on those people’s height cannot be fully explained by the decline in GDP alone. The early years of the transition process were more than just an economic recession. They involved dramatic changes to the functioning of the state, affecting the provision of basic public services (such as education and health care) and the functioning of the labour market, and had a significant impact on households’ expectations regarding their future prosperity. However, the results show that transition has not had negative long-term implications for the perceived well-being of cohorts born around the time of that process. If anything, people born during transition report higher levels of satisfaction than their peers. In this sense, while the negative effects of being born at that time are still tangible, they no longer seem to affect people’s well-being, perceptions and preferences. This optimistic message holds on average, but (as discussed in Chapter 1) the impact of the transition process has been highly heterogeneous. The resulting shock has been especially severe for those born during transition to disadvantaged families; these people report lower levels of satisfaction than peers of the same age from more privileged backgrounds. This chapter also looks at whether cohorts whose formative years coincided with the transition process differ from other people in terms of their attitudes and beliefs.9 Analysis of those cohorts’ current attitudes provides evidence regarding the attitudes and expectations that prevailed in those societies at the start of the transition process. In fact, there is no sign that the transition process has had a significant impact on those individuals’ satisfaction levels, trust in other people or preferences regarding redistribution. However, the positive sentiment surrounding the reform process does seem to have had an impact on some of their beliefs, with those cohorts expressing more support for the market economy and democracy than their peers. This finding is remarkable, given that the onset of the transition process had a dramatic impact on those individuals’ career prospects. They had just finished their education under the old system when the transition process began, and their human capital could have become less valuable in the new environment. LiTS III data show that there is no longer a gap between post-communist countries and comparators in terms of life satisfaction. Chart 2.1 reports average satisfaction levels for various groups of countries. Countries in Central Asia report very high levels of satisfaction, while central Europe and the Baltic states (CEB) are roughly on a par with Germany and Italy. South-eastern Europe (SEE), eastern Europe and the Caucasus (EEC) and Russia have satisfaction levels similar to those seen in Cyprus, Greece and Turkey. The average level of satisfaction in post-communist countries is 51 per cent – well below the 57 per cent seen in Germany and Italy. However, this difference is fully explained by the fact that post-communist countries have lower levels of income per capita. Chart 2.2 shows changes in both the percentage of residents expressing satisfaction with their life and countries’ GDP per capita between 2010 and 2015-16. With the exception of three outliers (the Kyrgyz Republic, Tajikistan and Uzbekistan), there is a strong positive correlation between a country’s level of development and life satisfaction. Even without the Kyrgyz Republic, Tajikistan and Uzbekistan – which report unusually high levels of satisfaction given their income per capita – satisfaction levels in post-communist countries are no lower than those seen in comparator countries with similar income levels. Indeed, when income per capita is controlled for, there is no significant difference between post-communist and other countries. This result is not driven by any particular country. Chart 2.2 also shows that this “happiness convergence” is the result of both substantial increases in satisfaction in most post-communist countries and decreases in satisfaction in comparator countries between 2010 and 2015-16. In Germany and Turkey, satisfaction declined despite income growth. In Italy, meanwhile, satisfaction declined in parallel with a fall in GDP per capita, but the decline in satisfaction was more pronounced than the fall in GDP would have predicted. Cyprus and Greece were not covered by LiTS II, which was conducted in 2010, but their current satisfaction levels are lower than their per capita incomes would predict. This is in stark contrast with the picture in 2010, when satisfaction levels in all Western countries were significantly higher than their per capita incomes would have suggested. Thus, the transition happiness gap was still present in 2010. A number of academics predicted that it would disappear by 2010, and that might well have happened, had the global financial and economic crisis not had a disproportionate impact on the post-communist countries, resulting in a pronounced negative effect on satisfaction levels. Since 2010, satisfaction levels in those countries have recovered strongly, while the comparator countries have suffered a prolonged stagnation, resulting in satisfaction levels falling and converging toward those of their post-communist counterparts. The absence of a transition happiness gap in Chart 2.2 is confirmed by econometric testing. These tests (the results of which are reported in Table 2.1) are based on a conventional model of life satisfaction – that is to say, satisfaction is regressed on various individual and household-level characteristics, such as education, age, gender, marital status, the number of children in the household, religion, being a member of an ethnic minority, whether the respondent’s place of birth is urban (rather than rural) and employment status. Several proxies for income are also included: self-reported household income, as well as answers to questions on whether the household can afford (i) holidays and meat, chicken or fish and (ii) unexpected expenses. Using self-reported income significantly reduces the size of the sample, as only a third of households report their income, whereas answers to the questions on what households can afford are available for almost all households. In order to simplify the interpretation of the results, Table 2.1 reports only results for the binary measure of life satisfaction (that is to say, whether the respondent is satisfied with life or not); the results for the five-point measure of satisfaction are very similar. The main variable of interest in Table 2.1 is residence in a post-communist country. The coefficient for this variable is not statistically significant in any of the specifications. This means that satisfaction levels in post-communist countries are the same as in comparator countries in the sample (when controlling for other individual or household-level determinants of satisfaction). Columns 1 to 5 compare post-communist countries with Germany and Italy. Column 1, which reports results without controlling for respondents’ income, indicates that the probability of satisfaction is 4 percentage points higher in Germany and Italy, but this effect is not statistically significant. Once income is controlled for, there is no difference in satisfaction between those Western countries and the post-communist countries in the sample (see columns 2 to 5). Columns 6 and 7 compare the post-communist countries with all five comparator countries in the sample (that is to say, Cyprus, Germany, Greece, Italy and Turkey). On average, satisfaction levels are higher in post-communist countries than they are in these five countries (especially when controlling for income); however, that effect is not significant. All of the specifications above include the Kyrgyz Republic, Tajikistan and Uzbekistan; a model excluding these countries produces similar results. Overall, these results suggest that, in terms of life satisfaction, there is no longer a statistically significant difference between countries that have experienced transition from a planned to a market economy and those that have not. SOURCE: LiTS III and authors’ calculations. NOTE: The chart shows the percentage of respondents who agree or strongly agree with the statement “All things considered, I am satisfied with my life now”. The blue bars indicate simple regional averages. The red bars indicate the level of satisfaction when adjusted for individual and household-level characteristics (see Table 2.1). The average for the SEE region does not include Cyprus or Greece, which are shown separately with Turkey. SOURCE: LiTS II and III, World Development Indicators and authors’ calculations. NOTE: The vertical axis shows the percentage of respondents who agree or strongly agree with the statement “All things considered, I am satisfied with my life now”. The horizontal axis shows GDP per capita in purchasing power parity (PPP) terms (based on 2011 US dollars). Arrows show changes in GDP per capita between 2010 and 2015 and changes in the percentage of respondents expressing satisfaction with their life between 2010 and 2015-16. A green arrow indicates that the country is now better off on both counts, a red arrow indicates that it is worse off on both counts, and a yellow arrow indicates that the country has seen positive income growth but registered a decline in satisfaction levels. The light blue diamonds show GDP per capita in 2010 and the percentage of respondents expressing satisfaction with their life in 2010 for those countries that were surveyed as part of LiTS II only. The blue squares show GDP per capita in 2015 and the percentage of respondents expressing satisfaction with their life in 2015-16 for those countries that were surveyed as part of LiTS III only. The dotted lines show the linear relationships for post-communist countries (excluding the three outliers: the Kyrgyz Republic, Tajikistan and Uzbekistan) in 2010 and 2015-16. NOTE: This table reports the results of a linear probability model. Standard errors in parentheses are clustered at the country level. *, ** and *** denote values that are statistically significant at the 10, 5 and 1 per cent levels respectively. Income is self-reported in local currency and converted to US dollars and log terms. Dummies for religion (not reported) are statistically significant. Data on the number of children relate to the number of children under the age of 18 who are living at home. Specifications 1 to 5 comprise the 29 post-communist countries plus Germany and Italy. Specifications 6 and 7 also include Cyprus, Greece and Turkey. Chart 2.3 shows the evolution of average height in post-communist countries as a function of the difference between respondents’ birth year and the year when transition occurred. Average height gradually increased over time, before declining in cohorts born two to three years before transition occurred and remaining depressed for a number of years. The first sustained increases in average height were observed in cohorts born six years after transition, at which point average height returned to the pre-transition trend level. Differences in height between people born around the time of the transition process and the trend are statistically significant. Just how unusual are these developments in average height? Chart 2.4 shows the evolution of average height over time for four developed economies: Cyprus, Germany, Greece and Italy. Given that there are fewer observations for each cohort in these countries, it makes more sense to look at the fitted trend line, rather than the actual data. The trend line rises sharply until the 1970s, before flattening out at a level corresponding to the average GDP per capita of around US$ 15,000 in PPP terms (see right-hand scale). Such stagnation is known as “height satiation”: beyond a certain level of development, additional material resources do not contribute much more to increases in height.11 Almost all post-communist countries began the transition process with average incomes below this threshold. Analysis later in the chapter distinguishes between countries that are above and below this threshold, finding that there is only a “height gap” in countries that are below the threshold. Further analysis shows that the negative effect of the transition process is only partially explained by fluctuations in GDP (see columns 3 and 4). Thus, while the economic recessions seen in the early years of the transition process represented an important mechanism in terms of the impact on households,13 they were not the only channel in operation. Other channels through which society was affected included decreases in the quality of public goods and the deterioration of state institutions and social capital. Other econometric results (not reported in the table) indicate that parents’ level of education (particularly the mother’s) has a positive impact on height. Meanwhile, the effects of parents’ employment sector are not statistically significant. Being born or turning one during a war has a negative impact on height that is similar in magnitude to the effect of transition; however, once changes in GDP are controlled for, the impact of war ceases to be statistically significant. All of the results presented in the table are robust to the replacement of country-specific linear trends with birth year fixed effects and country fixed effects. The analysis above uses a binary measure of transition, assuming that transition began in the year of price liberalisation (the “transition year”). Table 2.3 presents the results of alternative analysis based on a continuous measure of reform, using changes in the EBRD’s price liberalisation indicator as a proxy for the speed of the reform process. The results are the same as in Table 2.2, in terms of both statistical significance and the magnitude of the effect. A two-point increase in the transition indicator, from 1 (signalling that most prices are formally controlled by the government) to 3 (indicating that significant progress has been made with reforms), translates into a reduction in height – relative to trend levels – of approximately 1.1 cm. The results remain the same if the speed of the reform process is measured on the basis of an average of all six of the EBRD’s transition indicators, rather than just the price liberalisation indicator. The fact that cohorts born around the time of transition are shorter than their peers is evidence of the hardship associated with the early years of the reform process. Does this mean that these individuals are still disadvantaged today? LiTS data show that the transition process has not had a lasting negative impact on the satisfaction levels of these cohorts. On the contrary, respondents who were in their infancy when transition occurred are now more – rather than less – satisfied than their peers; specifically, they are 14 percentage points more likely to be satisfied with life. This effect is robust to various specifications and applies to both definitions of satisfaction: both the binary measure and the five-point scale (see Table 2.4). Why are these cohorts happier than their peers? Econometric tests show that these cohorts are not significantly different from their younger and older peers in terms of incomes, employment or family outcomes. However, they are better educated than their predecessors (even when controlling for age). Thus, the expansion of education systems in the post-communist period is at least one explanation for the higher levels of satisfaction seen in these cohorts. In addition to affecting the physical well-being of people who experience it in the first two years of life, the transition process also influences the attitudes and beliefs of people who experience it in their formative years. Table 2.5 reports the results of analysis looking at the attitudes of respondents who were between 18 and 25 when transition took place.14 Individuals who experienced transition in their formative years are approximately 3 percentage points more likely than their peers to express a preference for the market economy and democracy, but there are no other significant differences – that is to say, they do not differ from their peers in terms of life satisfaction, optimism, preferences regarding redistribution, social capital or other attitudes. NOTE: The line denotes average height in post-communist countries, calculated as a three-year moving average. The horizontal axis shows the difference between the respondent’s year of birth and the year when transition occurred (with the transition year varying from country to country, as Box 2.1 explains). SOURCE: Gapminder, LiTS III and authors’ calculations. NOTE: The blue diamonds show average height by birth year, calculated as a three-year moving average, while the green line shows a population-weighted three-year moving average of GDP per capita. Averages are calculated for four comparator countries: Cyprus, Germany, Greece and Italy. GDP per capita is expressed in PPP terms (based on 2011 US dollars). SOURCE: LiTS III, Correlates of War Data, EBRD transition indicators, Gapminder, UCDP/PRIO Armed Conflict Dataset, and authors’ calculations. NOTE: Standard errors in parentheses are clustered at the PSU level. *, ** and *** denote values that are statistically significant at the 10, 5 and 1 per cent levels respectively. All specifications control for country fixed effects and country-specific linear time trends. In addition, the gender of the respondent, whether the respondent was born in an urban or rural location, the respondent’s religion, the parents’ level of education and the incidence of war are also included as controls. Specifications 3 and 4 also control for the parents’ employment sector and the log of GDP per capita. SOURCE: LiTS III, Correlates of War Data, EBRD transition indicators, UCDP/PRIO Armed Conflict Dataset, and authors’ calculations. NOTE: Standard errors in parentheses are clustered at the PSU level. *, ** and *** denote values that are statistically significant at the 10, 5 and 1 per cent levels respectively. All specifications control for country fixed effects and birth year fixed effects. In addition, the gender of the respondent, whether the respondent was born in an urban or rural location, the respondent’s religion, the parents’ level of education and the incidence of war are also included as controls. NOTE: Standard errors in parentheses are clustered at the PSU level. *, ** and *** denote values that are statistically significant at the 10, 5 and 1 per cent levels respectively. All specifications control for country fixed effects and birth year fixed effects. In addition, the respondent’s gender, whether the respondent was born in an urban or rural location, the respondent’s religion, the parents’ level of education and the incidence of war are also included as controls. The impact of transition has not been equally distributed across society. This section documents the ways in which the transition process has affected different social groups. Not surprisingly, the most vulnerable people have been those born to disadvantaged families. There are no data on the living standards of the parents of LiTS respondents prior to the transition process. Consequently, for the purposes of the analysis in this section, those living standards are proxied by parental labour force participation and parents’ level of education. In this section, the impact that the transition process has had on well-being is estimated separately for subsamples with different parental backgrounds. In particular, Chart 2.5 reports the impact that transition has had on satisfaction on the basis of the mother’s labour force participation. As was shown in the previous section, cohorts who were born or turned one in the transition year are, on average, actually happier than their peers. However, this is not the case where the respondent’s mother has never worked. On the contrary, those respondents appear to be less satisfied with their lives as a consequence of being born at that time. Such families account for around 20 per cent of the sample. Parents’ level of education also plays an important role. A child of a tertiary-educated mother is much more likely to be satisfied with life after being born during transition than a child whose mother has completed only primary education or has had no formal education (see Chart 2.6). For families in the latter category (which make up around 13 per cent of the sample), being born during transition has a negative impact on life satisfaction. This is consistent with the evidence presented in Chart 2.7, which shows that these families also experienced a greater degree of socio-economic deprivation during the early years of the transition process. The negative impact that being born during transition has had on height is concentrated in these families. At the same time, the transition process has had almost no impact on height in families where mothers have completed tertiary education. Another important question is whether the transition process has affected ethnic majorities and minorities to differing extents. The data suggest that there has been no significant difference between ethnic majorities and minorities or between people born in their country of residence and people born elsewhere in terms of the impact that being born during transition has had on their height or life satisfaction. However, there is a difference in terms of the attitudes of the cohorts that experienced transition during their formative years. Within those cohorts, ethnic minorities report significantly lower levels of support for the market economy and democracy and have less trust in other people. Indeed, the fact that, on average, people who have experienced transition in their formative years show higher levels of support for the market economy and democracy is driven solely by ethnic majorities. NOTE: The dark grey bars show the sum of the coefficients for the “born in transition” indicator and the interaction term (signalling that the mother has never worked) and indicate the impact that transition has had on those respondents whose mothers have never participated in the labour market. The blue bars show the coefficient for the “born in transition” indicator and indicate the impact that transition has had on those respondents whose mothers have participated in the labour market at some point in their life. These effects are calculated after controlling for individual and parental characteristics. NOTE: The bars show the sum of the coefficients of the “born in transition” indicator and the interaction term (indicating the mother’s level of education). These effects are calculated after controlling for individual and parental characteristics. NOTE: The bars show the sum of the coefficients for the “born in transition” indicator and the interaction term (indicating the mother’s level of education). These effects are calculated after controlling for individual and parental characteristics. Could the results detailed above be driven by other events that coincided with the transition process? The transition period was preceded by various highly consequential political and economic developments – primarily the fall of the Berlin Wall and the dissolution of the Soviet Union – which marked the end of an era and heralded the beginning of a new order. In order to rule out the possibility that the results set out in this chapter were driven by those events, a set of placebo tests have been run to ensure that people who were born or in their infancy in the two years in question (namely, 1989 and 1991 respectively) do not differ from their younger and older peers in terms of height or satisfaction. The results of those tests show that those events do not explain the main findings of this chapter, demonstrating that it really is exposure to the transition process (which began at different times in different countries) – and not simply being born around the time of the fall of the Berlin Wall or the dissolution of the Soviet Union – that has caused respondents in post-communist countries to be shorter than their peers. Another placebo test has been used to check whether cohorts born in the early to mid-1990s in comparator countries also have an average height that is significantly different from that of their peers. This test also finds no significant effects. A further test looks at whether cohorts experiencing transition really are the best groups to focus on. Could it be, for example, that the transition process has simply affected everyone who has grown up since that process began? Econometric analysis looking at the height of people born one to three years after transition and three to five years after transition confirms the pattern shown in Chart 2.3. If anything, people born some time after transition tend to be taller, suggesting that the hardship that accompanied the transition process had a severe impact on those experiencing it at that age, but was mostly temporary in nature. In addition to the first two years of life, there are two other critical periods for a child’s growth: the time spent in utero and adolescence (defined here as the period from the age of 11 to the age of 14, which coincides with the second period of fast speed in height growth). Adverse environmental conditions during these two periods have been shown to delay growth and negatively affect the final outcome in terms of adult height.15 However, respondents who were in their mother’s womb in the year when transition occurred or experienced transition in their adolescent years show no statistically significant differences in terms of their height and life satisfaction. Lastly, it is important to look at whether post-communist countries experience height satiation. The LiTS data on comparator countries show that when GDP per capita reaches US$ 15,000 in PPP terms, additional economic growth has only a limited impact on height (see Chart 2.4). In order to see whether this is also the case for post-communist countries, another exercise divides those countries into two separate groups – one with GDP per capita of less than US$ 12,500 and another with GDP per capita in excess of US$ 15,000 – and looks at the impact that transition has had on height in those two groups. The results of that exercise suggest that the overall effect is driven by countries with GDP per capita of less than US$ 12,500, confirming that the height satiation observed in developed countries is also present in some post-communist countries. This chapter uses a unique Life in Transition Survey to measure the impact that transition from a planned to a market economy has had on well-being. In the past, research has found people in post-communist countries to be less happy than peers in countries that have not experienced such a transition (even after controlling for income), with some researchers suggesting that this “transition happiness gap” represents a temporary phenomenon that will eventually disappear. LiTS III, which surveyed more than 51,000 households in 29 post-communist countries and five comparator countries, confirms that this gap has finally been closed: when income is controlled for, residents of post-communist countries no longer lag behind their counterparts in terms of reported levels of satisfaction. However, this does not mean that the pain of the transition process was not real. LiTS III provides information that helps to quantify the magnitude of the socio-economic shock that was experienced in the first few years of the transition process. Comparing the height of individuals experiencing transition in their first two years of life, this chapter finds that those individuals are, on average, around 1 cm shorter than their younger and older peers. This confirms the view that the first few years of the transition process were a period of substantial socio-economic deprivation. At the same time, that shock does not seem to have had negative long-term implications for those individuals’ levels of satisfaction or attitudes. If anything, cohorts born around the time of the transition process are now happier (and better educated) than their peers. The other important finding in this chapter is that, while the process of “happiness convergence” has, on the whole, been completed, certain sections of society still lag behind. Not surprisingly, this concerns individuals born to families with low levels of maternal education and employment (who make up 20 per cent of the cohorts born around the time of the transition process). Lastly, this chapter’s optimistic overall message also points to a major risk relating to the “short-term pain, long-term gain” scenario. The risk here is that the political reaction to the pain of reforms could persist even after the pain has gone. Although the effects of the initial transition shock in post-communist countries can no longer be seen at the level of households, some countries have experienced policy reversals that persist to this day. That transition shock has armed opportunistic politicians with an anti-reform narrative, which has ultimately resulted in de-democratisation.17 Where these politicians have gained power, they have gone on to undermine both democratic political institutions and economic institutions.18 The subsequent removal of democratic checks and balances has now made it hard to vote these politicians out of office, despite their original anti-transition platform having ceased to be valid. In order to avoid such lasting political implications, reformers should try to compensate potential losers in reform processes from the outset, preventing populists from potentially destroying political institutions. This chapter analyses the impact that the transition process has had on objective and subjective well-being at the level of individual respondents. The primary data source for this chapter is the third round of the Life in Transition Survey, which was conducted by the EBRD and the World Bank in 34 countries in late 2015 and the first half of 2016. The results of that survey will be published later this year. A total of 75 locations were visited in each of the countries surveyed, with more than 51,000 interviews being conducted with randomly selected households. The main variables that are of interest for the analysis presented here are (self-reported) height and life satisfaction.19 The latter is captured in two ways: using a binary variable that simply indicates whether or not the respondent agrees or strongly agrees with the statement “All things considered, I am satisfied with my life now”; and using a continuous variable with a five-point scale. LiTS III also provides data on respondents’ support for democracy and the market economy, optimism,20 preferences regarding income redistribution, generalised social trust and active membership of associations. where the binary dependent variable for individual i, born in country c and aged , is regressed on an indicator that takes a value of 1 if c is a post-communist country, as well as a vector of individual characteristics ( ) listed in Table 2.1. These include age and age squared (or, alternatively, birth year fixed effects). Standard errors are clustered at the country level. The coefficient denotes the effect that living in a post-communist country has on life satisfaction (when controlling for conventional individual and household-level determinants of happiness). If is negative and significant, this means that the transition happiness gap is still present; if there is no significant negative effect, the gap has been closed. The second part of the chapter looks at the way in which the effect of the transition process varies depending on when people were born. First, it evaluates the physical impact of the transition process by comparing anthropometric indicators for people who were born or turned one or two during transition with those of individuals who were born before or after that period.21 Although the environment where a person grows up determines only around 20 per cent of adult height, it accounts for most of the cross-population variation in that indicator.22 Final adult height depends crucially on the speed of growth during the first two years of life – which, in turn, depends on living standards in the household during that period. A similar analysis is repeated for the life satisfaction of cohorts who were born or turned one or two during transition. For the purposes of the statistical analysis in this chapter, the transition period is defined as the year when the country in question made significant progress with price liberalisation reforms (which corresponds to the point at which the EBRD’s price liberalisation indicator for that country reached a value of 3 for the first time). Overall, 12 countries implemented the bulk of their price liberalisation reforms between the fall of the Berlin Wall and the dissolution of the Soviet Union, and 12 other countries followed suit between 1992 and 1993. The five remaining countries did not implement reforms until later, doing so between 1994 and 1995. This analysis also includes alternative continuous measures of transition tracking ongoing progress with reforms – namely, changes in the EBRD’s price liberalisation indicator and changes in the average of all six transition indicators over a given period of time.25 As with the approach described above, three variables are created, indicating (i) the change in the respondent’s year of birth relative to the previous year, (ii) the change in the year when the respondent turned one relative to the year before his/her birth, and (iii) the change in the year when the respondent turned two relative to the year before his/her birth. For the analysis of formative years, changes are calculated for the period when the respondent was 18 to 25 years old. These binary and continuous measures of reform should not be seen as substitutes, but rather as complements, since they assess different facets of the transition process and address critical concerns regarding the causality of the analysis. Indeed, a major challenge for the analysis is the question of reverse causality. In planned economies that were bankrupt and experiencing severe shortages of vital nutrients before reforms took place, political and economic transition might, in fact, have been a consequence of deprivation, rather than the other way round. Controlling for fluctuations in GDP and using continuous variables indicating changes in the price liberalisation indicator or the average of all transition indicators should address these concerns. where the reported height of individual i, born in year y and country c, is regressed on an indicator – “born in transition” – which takes a value of 1 if the individual was born or turned one in the year when transition occurred. is a vector of individual and household-level characteristics, as well as country-specific factors, all of which are likely to affect the outcomes of interest. These controls include gender, whether the respondent was born in an urban or rural location, religion and parental background (namely, parents’ level of education and employment sector). At the country level, regressions control for GDP per capita and incidence of war.26 Country fixed effects ( ) capture any time-invariant country characteristics, while country-specific linear time trends control for the natural increases in height that are typically seen over time in most middle-income countries. The country-specific linear trend is defined as follows: The same specification is used for the continuous measures of reform discussed above. The “born in transition” indicator is replaced with the change in the price liberalisation indicator or the change in the average of all six transition indicators over the relevant period of time. where the outcome (satisfaction with life, trust, and attitudes to the market economy, democracy, redistribution and so on) is regressed on the “born in transition” indicator, as well as – a vector of controls including gender, whether the respondent was born in an urban or rural location, religion, parents’ level of education and incidence of war. Country fixed effects ( ) and birth year fixed effects ( ) are also included. Birth year fixed effects control for highly non-linear relationships between age and life satisfaction, while the regressions can still identify the effects of being “born in transition” because countries are considered to have undergone transition in different years. A 25-year-old living in a country where transition took place in 1990 is classified as having been born after transition (if the survey was conducted in 2016). However, a person of the same age living in a country where transition took place in 1993 is considered to have been born two years before the start of transition, so his/her height and satisfaction with life are likely to have been affected by that process. The results derived from the Life in Transition Survey can be validated by another household survey – the Russian Longitudinal Monitoring Survey (RLMS) conducted by the Higher School of Economics in Moscow. Although the RLMS covers only one country, it has two unique advantages. Its panel dataset consists of various survey rounds from 1994 to 2014, including both adult and child respondents from individual households, which means that the impact that transition has had on children’s heights can be measured while controlling for the height of parents.28 It also allows within-family analysis, making it possible to see the effect of being born during transition by comparing a child with a sibling who was born before or after transition took place. As Table 2.2.1 shows, the results derived from the RLMS are generally consistent with those obtained for post-communist countries as a whole. As the first two columns show, people born in the transition year are, on average, around 1.4 cm shorter than would be expected on the basis of historical trends, while those born in the transition year or the previous year are an average of around 1.5 cm shorter. Given that the RLMS started in 1994, it is possible to estimate the impact that the transition process had on the heights of individuals born during this period while they were still children. Columns 3 and 4 of Table 2.2.1 show the coefficients estimated for height-for-age z-scores for the children’s sample, which imply a significant reduction – around 1.5 cm – in implied adult height after controlling for the mother’s height and level of education. The validity of these results could be open to question if the parents of children born during the transition process were fundamentally different from those of children born before or after transition. In that case, there could therefore be a risk of mistakenly ascribing findings that might reflect such systematic differences (such as differences in the age or level of education of childbearing parents) to the effects of having been born during transition. RLMS data do show that mothers and fathers whose children were born in the transition year or the previous year were, on average, one year younger than those whose children were born before or after that period. The estimates in Table 2.2.1 partially address these concerns regarding endogenous childbirth choices, as the analysis controls for parents’ level of education and height. Two additional exercises confirm the robustness of the findings. First, columns 5 and 6 present the results of a comparison looking at differences in height between siblings in the same family when one of them was born during transition. The implied impact of being born during transition in terms of differences in adult height between siblings is in the order of 3-4 cm – even larger than in the cross-section. Second, a propensity score matching methodology allows the selection of a sample of individuals who are similar to those born during transition in terms of observable parental characteristics (level of education, employment sector, religion and so on), whether the respondent was born in an urban location, gender and the age at which the mother gave birth. A comparison with this sample suggests that the average effect of being born during transition is larger than that shown in columns 3 and 4 and closer to those derived from the within-family models. Are Russians who were born during transition more or less satisfied with their lives than their peers? RLMS data on life satisfaction show that average satisfaction levels among Russians increased sharply between 1994 and 2014. A model that controls for the age of the respondent and the year in which the survey was conducted shows no significant difference between people born during transition and other respondents in terms of life satisfaction. When the sample is restricted to individuals who were observed as children under the RLMS, for whom it is possible to control for parental characteristics (level of education, height and so on), coefficients are positive and marginally significant. This is consistent with findings derived from LiTS III for post-communist countries as a whole. SOURCE: RLMS, EBRD transition indicators, and authors’ calculations. NOTE: Standard errors are shown in parentheses. *, ** and *** denote values that are statistically significant at the 10, 5 and 1 per cent levels respectively. All specifications control for the respondent’s gender and whether he/she is resident in an urban location, as well as regional linear trends and region fixed effects. Specifications 3 and 4 also control for the mother’s level of education and height, while specifications 5 and 6 control for family fixed effects. In specifications 1 to 4, standard errors are clustered by region. Within-family estimates (specifications 5 and 6) only include data derived from surveys between 1994 and 2008 in the interests of consistency regarding family identifiers. Children’s heights are converted into height-for-age z-scores after subtracting the average and dividing by the standard deviation of the heights of US children of the same age in the WHO Global Database based on US population data. “Is the 1918 Influenza Pandemic Over? Long-Term Effects of In Utero Influenza Exposure in the Post-1940 U.S. Population”, Journal of Political Economy, Vol. 114(4), pp. 672-712. “The Ecology of Height: The Effect of Microbial Transmission on Human Height”, Perspectives in Biology and Medicine, Vol. 45(4), pp. 475-498. “Does Money Protect Health Status? Evidence from South African Pensions”, in D. Wise (ed. ), Perspectives on the Economics of Aging, pp. 287-312. “Causes and Consequences of Early-Life Health”, Demography, supplement to Vol. 47(1), pp. S65-S85. “Income, Health, and Well-Being around the World: Evidence from the Gallup World Poll”, Journal of Economic Perspectives, Vol. 22(2), pp. 53-72. “The Divergent Post-Communist Paths to Democracy”, Journal of Economic Perspectives, forthcoming. “The Happiness Gap in Eastern Europe”, Journal of Comparative Economics, Vol. 44(1), pp. 108-124. “Grandmothers and Granddaughters: Old-Age Pensions and Intrahousehold Allocation in South Africa”, World Bank Economic Review, Vol. 17(1), pp. 1-25. “Life Satisfaction in the Transition from Socialism to Capitalism”, in A. Clark and C. Senik (eds. 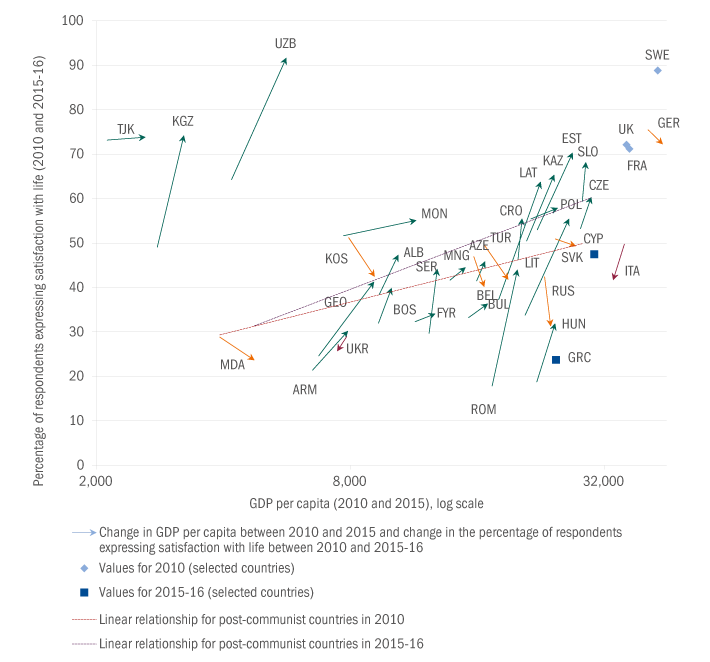 ), Happiness and Economic Growth: Lessons from Developing Countries, pp. 6-31. Transition Report 2013: Stuck in Transition?, Chapter 3, London. “Growing up in a Recession”, Review of Economic Studies, Vol. 81, pp. 787-817. “Armed Conflict 1946-2001: A New Dataset”, Journal of Peace Research, Vol. 39(5), pp. 615-637. “(Un)happiness in Transition”, Journal of Economic Perspectives, Vol. 23(2), pp. 143-168. “Data Resource Profile: The Russia Longitudinal Monitoring Survey—Higher School of Economics (RLMS-HSE) Phase II: Monitoring the economic and health situation in Russia, 1994–2013”, International Journal of Epidemiology, Vol. 45(2), pp. 395-401. “Early Environment and Child-to-Adult Growth Trajectories in the 1958 British Birth Cohort”, The American Journal of Clinical Nutrition, Vol. 80(1), pp. 185-192. “A century of trends in adult human height”, eLife, Vol. 5. “Minding the Happiness Gap: Political Institutions and Perceived Quality of Life in Transition”, European Journal of Political Economy, forthcoming. “The Effect of Adolescent Experience on Labor Market Outcomes: The Case of Height”, Journal of Political Economy, Vol. 112(5), pp. 1019-1053. “Armed Conflicts, 1946-2014”, Journal of Peace Research, Vol. 52(4), pp. 536–550. “Transition in Historical Perspective”, in A. Aslund and S. Djankov (eds. ), The Great Rebirth: Lessons from the Victory of Capitalism Over Communism, Peterson Institute for International Economics. “Small for gestational age: short stature and beyond”, Endocrine Reviews, Vol. 28, pp. 219-251. “Does Transition Make You Happy?”, Economics of Transition, Vol. 15(4), pp. 707-731. “Resort to war: A data guide to inter-state, extra-state, intra-state, and non-state wars, 1816-2007”, CQ Press, Washington, D.C.
“Stature and the Standard of Living”, Journal of Economic Literature, Vol. 33, pp. 1903-1940. “Economic Growth and Subjective Well-Being: Reassessing the Easterlin Paradox”, Brookings Papers on Economic Activity, Vol. 39(1), pp. 1-102. “The Political Economy of Change After Communism”, in A. Aslund and S. Djankov (eds. ), The Great Rebirth: Lessons from the Victory of Capitalism Over Communism, Peterson Institute for International Economics.